MEDASSET presenting at the annual meeting of the Bern Convention. Monitoring the conservation status of important sea turtle nesting beaches in the Mediterranean is one of MEDASSET’s key activities since 1988. We present our findings and recommendations to national and international authorities, such as the Bern Convention, to bring international attention to local conservation problems and encourage governments to take action. Find out more about the Bern Convention Case File system here. For the 26th year in succession, MEDASSET participated in the annual meeting of the Bern Convention at the Council of Europe (34th Standing Committee Meeting, Strasbourg, France, 2-5 December 2014). We presented the findings of our 2014 sea turtle nesting beach assessments, raised our concerns and submitted recommendations. As a result, the Bern Convention adopted decisions to monitor the following sea turtle habitats and to work with responsible national authorities to step up their protection. 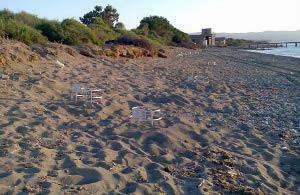 Nesting zone occupied by beach furniture and carpets in Fethiye, Turkey. Find out more about the background of this campaign here and download our 2014 report for more details. Our campaign since 2009 to reverse the longterm loggerhead nesting decline in Fethiye, a protected area under the Barcelona Convention, continues. In 2014, there was no improvement in the protection and management of the site. Longstanding issues of littering, planting on the beach, motorised water-sports, light pollution, unregulated beach furniture and carpet use, uncontrolled visitor and vehicle access, remain unsolved. Habitat destruction and unregulated coastal development continues, further reducing the available nesting habitat and increasing disturbances to nesting sea turtles. In addition, a shipyard construction project on the nesting beaches is being re-discussed and promoted by authorities. Find out more about our 25-year ‘’Save Patara’’ campaign here and download our 2014 report for more details. In 2014, we recorded several conservation problems in Patara’s loggerhead nesting beach, such as littering, wildfires, poor beach furniture management and lack of information signs, despite the area’s protected status under the Barcelona Convention. Patara’s sand dunes are among the most spectacular and near pristine in Turkey; however, a new beach bar was constructed on top of the dunes in 2014. Behind the beach and inside Patara’s protected archaeological area – a unique heritage site of international importance – the 300 holiday home construction project continues. Foundations were laid for more villas this year, in addition to the 27 villas that were completed in 2013. Through our campaign we are urging authorities to adequately protect the habitat against pressures and disturbances that we expect will increase many fold due to the much higher number of inhabitants and visitors. Conservation of Fethiye and Patara nesting sites is monitored by the Bern Convention under the same “case file” that was opened in 2013. Following our presentation and in the absence of a detailed report by Turkish authorities on specific remedial measures or commitments for improved protection, MEDASSET’s call for the case file to remain open and for an “on-the-spot appraisal” by the Bern Convention in Patara and Fethiye in summer 2015, was accepted. The appraisal will aim to identify a set of recommended remedial actions to be considered and adopted at the next meeting of the Convention in December 2015. The mountain of toxic waste deposited next to Kazanli nesting beach. MEDASSET monitors conservation problems in Kazanli’s green turtle nesting beach since 1999. The Bern Convention adopted a Recommendation in 2002 asking Turkey to take several specific measures to protect the habitat. Click here for more background details. In Kazanli’s important green turtle nesting beach, severe coastal erosion is reducing the available nesting area and the 1.5 million tonnes of toxic waste deposited next to the beach by a soda-chromium factory, is a pollution hazard for the habitat, sea turtles, human health and the Eastern Mediterranean Sea. MEDASSET presented a slideshow stressing the lack of official reports on action taken to address these and other unresolved conservation problems. The Turkish Delegate briefly informed about the implementation of several measures, explained that the relocation of buildings and greenhouses too close to the beach is pending land property legal processes and that authorities are seeking international expertise in order to start beach erosion control. 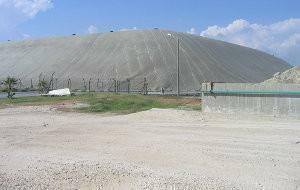 In relation to the toxic waste removal, the Delegate reported that the waste neutralisation process continues and a landfill for the by-product will start operating in 2015. However, no specific information was provided on the amount of waste that has been removed and treated. Though in 2009 Turkey committed to complete the removal process in 10 years, after 5 years there has been very little progress. The Bern Convention invited Turkey to urgently address pollution and erosion issues, to request the support of the Barcelona Convention, and decided to re-assess the situation at its 2015 meeting. Nesting beaches in South Kyparissia Bay host the second largest number of loggerhead nests in the Mediterranean. Although the site is a European NATURA 2000 protected area since 2002, the Greek government has failed to introduce and enforce the necessary conservation and management measures. As a result, the European Commission referred Greece to the European Court of Justice in March 2014 and the Bern Convention opened a case file in 2013 and organised an on-the-spot appraisal in summer 2014 in order to issue specific recommendations for the protection of the site. At the 2014 Bern Convention meeting, MEDASSET in collaboration with Greek NGO ARCHELON presented the continued site degradation and inadequate management of the site during summer 2014. Threats included sand dune destruction, housing and road construction, fishing, vehicle access on the nesting beach, poor beach furniture management and severe light pollution (see 2014 report for more details). We also presented the Greek NGOs objections to the Presidential Decree drafted by the Government in September 2014 for the “protection” of Kyparissia Bay. The draft Decree does not resolve conservation problems and instead seems to aim at serving developers’ interests, by legitimising illegal infrastructure and transforming this almost pristine natural habitat into a residential area. Despite the Greek Delegates’ objections and following mild amendments, the Bern Convention adopted a 12-measure Recommendation, urging Greece to prevent habitat deterioration and ensure improved protection. Indicative of the strong reaction to the severe pressures on the habitat due to construction interests, is the recommendation for a permanent construction ban in the core nesting area. For more details read the joint statement by ARCHELON, MEDASSET, WWF Greece regarding this crucial Recommendation. 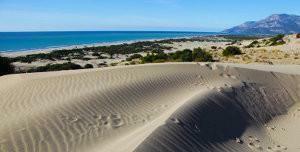 A huge golf resort has been licensed too close to the protected nesting beach in Limni, Cyprus. 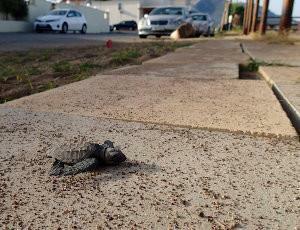 Conservation problems in loggerhead and green turtle nesting sites in Akamas and adjoining Limni were first brought to the attention of the Bern Convention by MEDASSET in 1996 and a case file remains open since 1997. Protection of these habitats is to be ensured via their designation as European Natura 2000 sites. The representative of NGO Terra Cypria presented the current situation and explained that the site boundaries proposed by the government do not adequately protect the sea turtle habitats, especially in the Limni area (see Terra Cypria’s 2014 report for more details). In addition, the development of a huge golf course and villa complex is planned at the back of Limni nesting beach, despite the NGOs requests for a 500 m protective buffer zone between the complex and the nesting beach. Terra Cypria called on the Bern Convention to continue monitoring this issue by keeping the file open and to encourage Cypriot authorities to fully implement recommended conservation measures, to put in place an early warning system against illegal habitat damage, and to report back to the Convention on progress regarding the European Natura 2000 site designation. MEDASSET seconded theses requests. Delegates stressed the importance of Akamas as a hotspot for biodiversity conservation and its vulnerability to excessive tourist developments. The Bern Convention decided to keep the case-file open, in light of the related ongoing infringement procedure at the European Commission level. Click here for the official List of Decisions adopted at the 34th meeting of the Bern Convention Standing Committee.